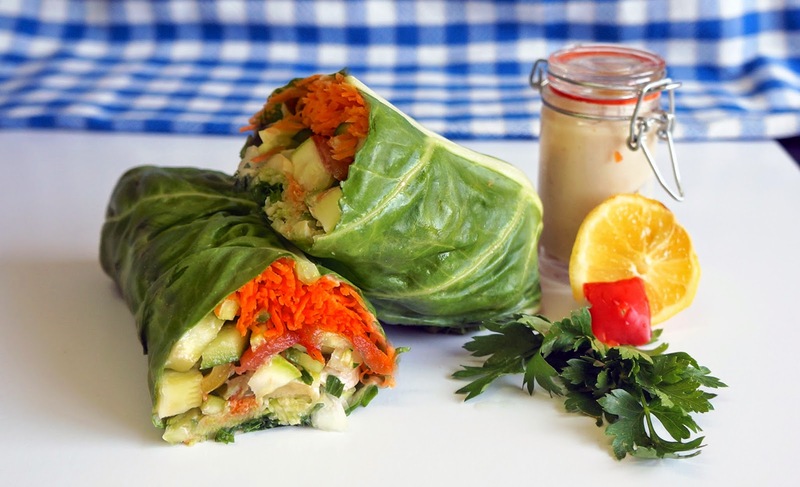 Tahini Veggie Collard Wraps; these are so easy to make and a great low-carb alternative to tortilla wraps. You can add whatever fillings you like (including your choice of protein – tofu, beans, organic chicken, fish etc.) but this is our favourite filling combo at the moment! We have included photos and a GIF below to show how to prepare; we are going to do this quite unconventionally and put the full method first and the how-to after so you can look at that if you need it! Anyway, enough of my waffling, here’s the recipe! • big handful of parsley chopped! *We made my own hummus/tahini using pure tahini, olive oil, lemon juice, salt and white beans, blended. 1. Thoroughly dry the large collard leaf (make sure there are no holes in it)! Spread over the hummus or mashed avocado, leaving a small border. 2. Add your veg! Make sure it’s a wide selection with different textures and flavours; cut to different sizes too for variety. 3. Drizzle with the pure tahini. 4. Roll up! Fold in the top and bottom first, turn on it’s side then fold over the bottom and roll over to the top, as shown in the video. 5. Slice in half with a serrated knife. Don’t forget to tag us on instagram @fresheather if you give these a go!